It has been awhile since I have featured any grand opera recordings. To remedy that, here is Italian baritone Riccardo Stracciari performing the barcarolle from Amilcare Ponchielli’s 1876 opera La Gioconda. This recording is from a single sided record. 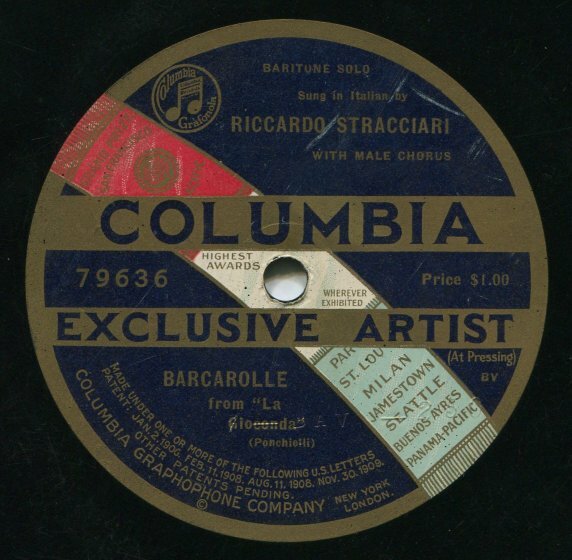 While double sided discs became standard for most records in 1908, classical and operatic recordings continued to be issued on single sided discs into the early 1920s. Such records were marketed as a premium product – and they certainly were not cheap. Using this handy cost of living calculator, the $1 price tag on the record in 1921 would have been worth approximately $13.82 in today’s currency. And for that the buyer got exactly what I present here – a single two and a half minute recording. This entry was posted in 1920s, Acoustic Recordings, American Recordings, Opera, Uncategorized. Bookmark the permalink.